The aim of this blog is to give you the heads up and a bunch of practical tips on the wonderful world of Web Browser Pushes. Enjoy! Want to make the most of your shop? Leveraging customer engagement through direct online marketing is one of the best tools we have. So far, directed emails have been the most successful route to success, but times are changing. We are now entering the age of Push Notifications, a great new, easy to use channel that really drives sales. What are web browser push notifications? Instant messages that are sent via web browsers to anyone who has subscribed to receive them.They work across a number of devices, computers, macs, android tablets and mobile devices and require no mobile app. Pushes offer a simple and instant way of getting your message out to your customer. But web pushes only work when you are on a seller’s website, right? Nope. The great, (and it is really, really, great) thing about Web Push notifications is that once a customer has subscribed to receive your pushes, you can send them to wherever they are on the web. What’s the difference between web browser push notifications and mobile push notification? While mobile app push notifications are limited to mobile devices and tablets, website push notifications also cover desktops, meaning that web push notifications deliver an extra 32% more potential customer engagement. What your shop gets with Pushes is a simple, direct and immediate​ way to send tailored messages to your customers. Yep we’re talking about messages that react to your customer’s purchases and buying. Let’s look at a couple of popular message types to show you how this works. 1.1. Delivery push Send immediate up to the minute updates to your customers on the delivery status of their order. These pushes communicate trust, engagement and real commitment to service​. Put yourself in your customer's shoes. You’ve bought the item and now you’re waiting for it to arrive. Delivery Updates really come through here. 1.2. Price drop Pushes Everybody loves lower prices. Price drop pushes are sent to subscribers based on what they have told you they want. What better way to drive sales than by showing your customer that not only do you know what they like, you also want to give it to them for a lower price. Scheduling is key here. As this is not an automated push, you need to make sure that you remember to send these out. The best way to do this is by using your calendar. And with click rates of 9­15%, they can really really help boost your sales. Upselling is the key to making your store really work for you. By being able to make instant recommendations or suggestions to your customers based on their purchase history or browsing habits, you’ll be able to maximise your sales potential. Not only that, you’ll be forging a stronger, more tailored bond with your customer. 2.2. Recover cart abandonment. We all know that cart abandonment is a huge issue in online sales. The staggering statistic is that 68.63% of all carts are abandoned, crowding up the internet with a mountain of missed sales. So the real task of good directed e­marketing is to transform those potential sales into real sales. Emails have been able to achieve a recovery rate of 4­5%​. Not bad. Push Notifications, on the other hand, can give nearly double that, 7%​. Even better. So by using cart abandonment pushes, you will be able to turn some of those maybe sales in cart abandonment limbo into real profits. There is no need to build a quality app, Web Push Notifications are a ready made, ready to go solution that can be added to your store with just one click. What’s more with all providers offering 24/7 support and regular updates there’s no headache, and, of course no tricky ROI that might be hard to square up. How to build that all important subscriber network. To make Web Push Notifications work, you need users to send them to. Growing your subscriber base does take time, but it's an investment that will pay off in increased sales. Once set up, every time a customer enters your site, they appear as an automatic prompt at the top of the page. Although they carry no actual message, and no indication of what the user will be sent, it’s clear from the results that users feel inclined to sign up. What is not so great is that because the user has no real idea of what they have signed up for, the click rate is less than stellar, at around 2%. Whether or not these auto prompt messages will go the way of the spam email and be engineered out of future browser versions is up for discussion, but for now, they are an easy way to build subscribers. Subscribing people blind will in the end never really benefit your store. Time and again we see that what keeps people coming back is not just good prices, but good personalized service. And that doesn’t come through spam. If you are intending to use auto prompts as a way of building your subscriber base makes sure that once your customer has subscribed to your pushes, you make the most of their engagement by sending pushes that deliver the value and service they are after. Sign up boxes are basically messages that invite users to sign up to receive specific pushes. Although a little less effective in terms of delivering solid subscriber numbers, they have the real value of guaranteeing that each subscription made by a user through them reflects a true customer need. When you are starting out. It is really important that you understand how valuable each sign up box is for driving subscribers. The basic and most important first rule is this: sign up boxes which reach more people, will, of course, deliver more subscribers. So a Price Drop sign up box is great as it will be shown on every product page of your site. You can also incentivize your customers to subscribe to your pushes by using Discount code sign up boxes. Not only are these sign ups very visible as they appear on your landing page, they also have the added allure of a freebie. 3. Other Sign Up Boxes will have far less potential subscribers because they only appear on certain pages of your website. A good example here would be Product Delivery sign up boxes. They are less visible as they only appear on in cart pages at the point of purchase, but remember they do have the benefit of being more specific to your customer. This means they will deliver a higher conversion rate, but a smaller number of subscribers. Back in stock sign up box is also quite limited in its reach, as most shops aim to have a full inventory at all times. So the amount of subscriptions they pick up is small. The only thing to bear in mind here is that if there is a popular item that you know is out of stock, you can use this sign up to collect subscribers who are truly engaged with your products. The basic point being, when it comes to building a base of push subscribers, you need to make the best use of all of the sign up boxes you have available. You can only maximise your user base, if you maximise the potential that your sign up boxes can offer you. 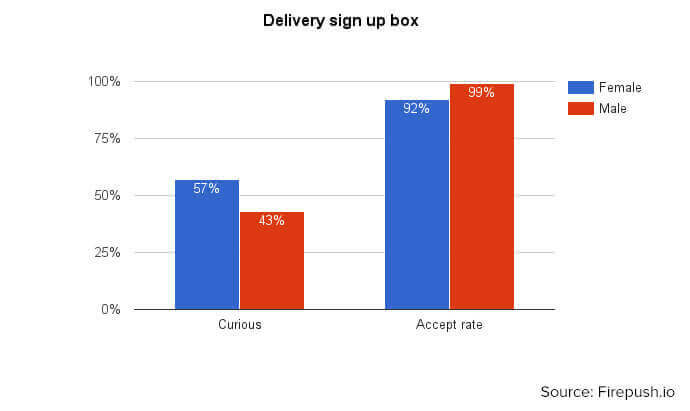 More data on what sign­up boxes work best. 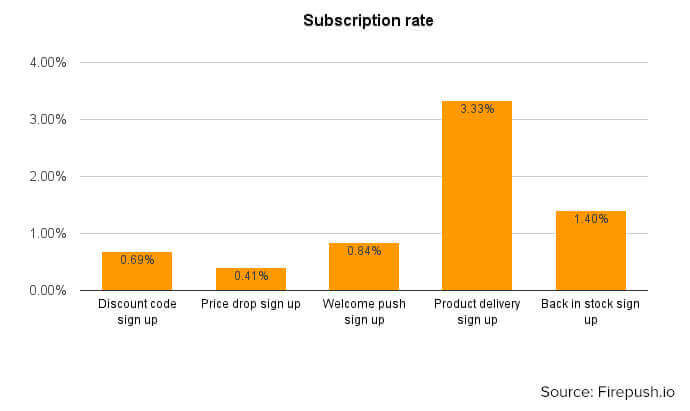 Let’s now have a closer look at some data on the subscription rates to some popular Sign Up boxes. This will give you a better idea on subscription tendencies which you can use for further segmentation. Having a more definite idea of segmentation will really benefit you later on when you have got your Pushes up and running and you start up­selling. 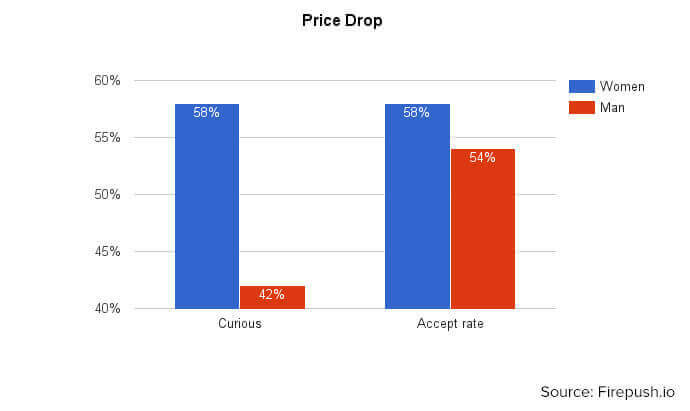 Price Drop: Women are more likely to respond and subscribe to Price Drop Sign Up­Boxes. 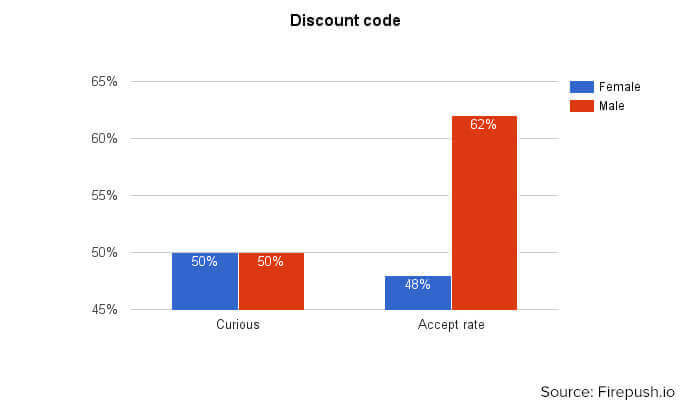 Discount: Both men and women are up for a discount, but men are far more likely to click through to accept and subscribe. Delivery: Interest is high for delivery updates, so these sign boxes are a good way of driving subscriber numbers. Both men and women are keen to track, but men are more likely to sign up for such pushes. How to convert email subscribers to push subscribers? You can send a message to all your existing email subscribers offering a one off discount or gift in return for subscribing to your pushes..
One Shopify music store, Mostly Music, a retailer of specialist music, sent two emails to its 55K users. The first email introduced the offer, and the second was designed to boost uptake. The offer was simple: the user received a free track in turn for their subscription to the store’s Push Notifications. 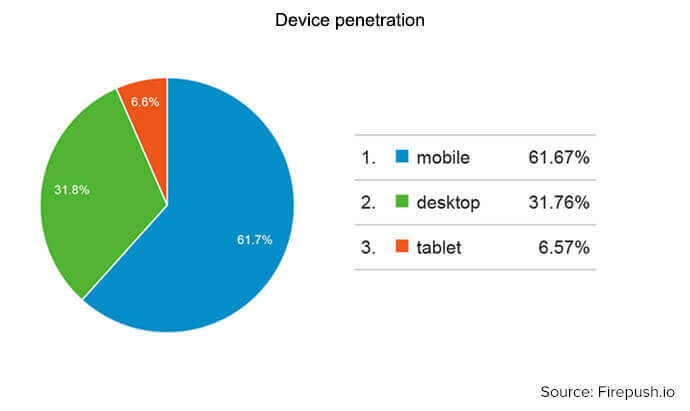 Of the 55k emails that were sent, 2182 were clicked on, generating a 3.9% click rate. If we look at Google trends we can see that in the last few years interest in Web Push Notifications has grown steadily. The reasons why are obvious. - They extend your reach as a store well beyond the limits of your site. - They can be segmented to optimise the effectiveness of your marketing. - They are personalized, so they give your sales that all important personal touch. At present less than 1% of all Shopify stores use Push Notifications. Now is the time to begin exploring how Pushes can help you to truly optimise your store’s sales potential. Get ahead of the curve today and give yourself a lead on your competitors.